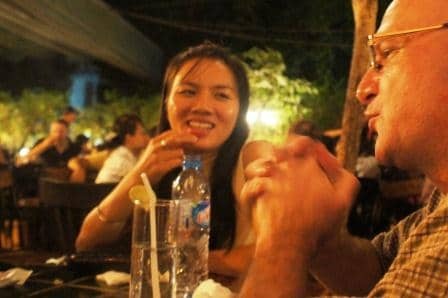 On my first flight to Saigon in 2008, I felt nervous about visiting a city with which my native land shares a painful and awkward history. But now, as I sit on an airplane, getting ready to touch down for the seventh time, I feel like I’m going home. Cheesy as that might sound, I get choked up as I type this. On my first trip, with my then-girlfriend / now-wife, Kattina, we landed at midnight and went straight to our hotel. It took only a few minutes of roaming the next morning before we were hooked. Our first night in Saigon four years ago, Kattina and I made our way across Pham Ngu Lao Street, a hectic boulevard with an endless torrent of motorbikes. On one side of the road, the backpacker zone bursts with cheap rooms, restaurants, bars, and T-shirt shops. On the other side is a park few tourists discover. It’s a popular hang-out for families and students. Within minutes, we found ourselves teaching an impromptu English lesson as more than a dozen young Saigonites – late teens to mid 20s – sat cross-legged on the ground around us. Two of the older ones, Nhi and Trung, became dear friends, as did Phúc, a tour guide we hired the next day to show us the Mekong Delta by bicycle and kayak. 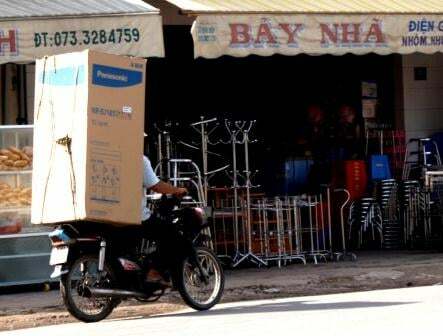 Now when we visit Saigon, we don’t sightsee. We hang out with our pals in local watering holes. They’ve shown us corners of their city tourists don’t normally see. We’ve shared our lives and personal stories over beers and glasses of strong, sugary Vietnamese iced coffee. I’ve visited more than 50 countries, and nowhere else in the world have I made close friends so quickly and easily. Be unobtrusive with your camera and don’t leave noseprints on the windows. 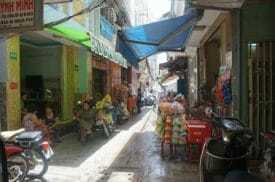 But don’t be afraid to explore the twisting alleyways that thread through the backpacker zone. 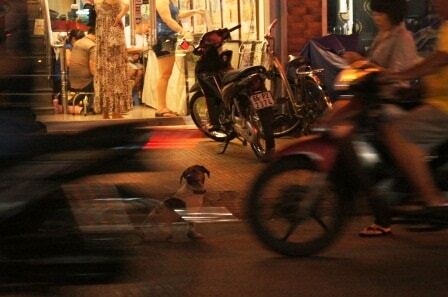 The real Saigon is all around you. 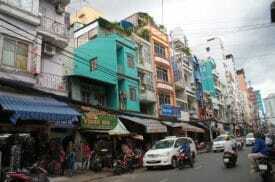 Most Southeast Asian cities have backpacker ghettos – tangles of hostels and cheap hotels. What sets Saigon apart is that its budget tourist area interweaves with a genuine local neighborhood. Wander near the intersections of De Tham and Bui Vien Streets and you’ll discover a labyrinth of alleyways. Pick a random alley. Use common sense and it’s safe to get a little lost. Families sit outside their homes, barbecuing lunch and gossiping with neighbors. Peek inside and smile as you pass (but please, avoid the urge to be obtrusive with your camera). You’ll catch glimpses of everyday Saigon living – far more fascinating than any official tourist attraction you’ll find in town. 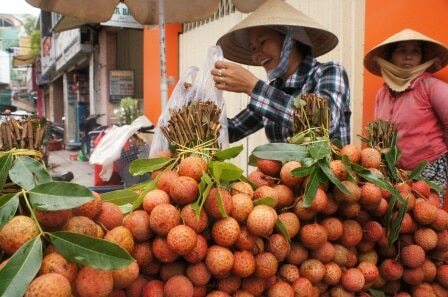 Vietnamese food is fragrant, healthy, and diverse. Pho (rice noodle soup) is the iconic favorite. You can eat it for lunch, dinner, or breakfast – spoon in one hand, chopsticks in the other. Fresh spring rolls come filled with shrimp, beansprouts, and mint leaves. I’ve become addicted to the less healthy deep-fried variety. Beef, chicken, or pork sautéed with fresh chili peppers and lemon grass and served with steamed rice is another one of my personal favorites. Two-wheeled barbecues? It’s the Tour de Squid! And when thirst or the need for liquid relaxants take over, your cheapest and most cultural option is a mug of bia hoi – mild and drinkable, freshly tapped beer that goes for around 30 cents. They’re not honking at you. They’re honking with you. Yes, it’s true; I love Saigon’s ridiculous traffic. Motorbikes buzz at all hours. At a busy intersection, watching them is like watching fireworks. Traffic lights and stop signs are rare so no one stops. Remarkably, accidents are equally rare. People slow down and weave through one another. They figure it out. One of my favorite things to do during rush hour is grab a beer at a street-corner bar and watch the show. You’ll see families of four, five, even six, squeezed onto a single bike. And Saigonites balance more stuff on their motorcycles than I can squeeze in a car – cases upon cases of beverages, television sets, chairs, desks, ladders, huge panes of glass… one time, in a coastal town, I even saw a guy shouldering a small fishing boat that was balanced precariously on the back of his bike. Need a fridge? They deliver. Sit back and enjoy the chaos, and everything will be just fine. Saigon is noisy and hectic. And herein lies the challenge to appreciating the city. You have to roll with it or it can drive you a little crazy. But embrace the energy and the city enthralls. With the motorbikes (and an increasing number of cars) comes lots of honking – and that’s just the beginning of the noise pollution. 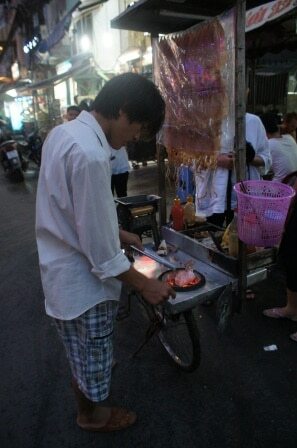 Food sellers with loudspeakers roam the streets. Masseurs on bicycles advertise their services by shaking rattles. Western pop music blasts from bars with open storefronts. Rickshaw drivers shout for your attention. Add to that restaurant touts, wandering vendors hawking trinkets you don’t want, shoe shiners, big holes in the sidewalk, heat, humidity, and perhaps your own travel fatigue or jet lag – it is sensory overload. All of this – even the annoying parts – make Saigon an authentic carnival, a crazy city with a rapid pulse. Take a deep breath and let it engulf you. Absorb the humanity and be one with it. Smile at people you don’t feel like smiling at and watch what happens. The trick to loving Saigon is in savoring its chaos. Even the architecture is a little chaotic. Saigon has a couple of worthwhile tourist attractions, but they aren’t the reason I keep returning. Maybe I got lucky in finding close friends here as quickly as I did, but even if I hadn’t, I’m pretty sure I’d still be flying in for my seventh trip. It’s a phenomenal city to do nothing in – to simply hang out, and people-watch, and exist. When my friends aren’t around, I spend many hours wandering aimlessly among buildings of random height that stand like giant, multi-colored houses of cards. I never get bored. There’s something new to see every few feet – even on streets I’ve covered many times prior. So the best thing to do when you’re in Saigon? Take in the sights if they interest you – but also allow more time than you think you’ll need for doing “nothing.” Get lost, sit in a café, or hop on a motorbike and soak in the energy of this scintillating city. I keep coming back here to hang out, to recharge my mental batteries, to see friends, and to feel exceptionally, blissfully alive. Join Me on a Travel Writing & Photography Tour in Vietnam! 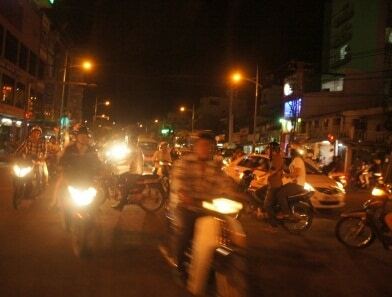 Ask Dave: How Can I Avoid Taxi Ripoffs in Saigon? Ask Dave: How Many Days in Phnom Penh and Siem Reap? Interesting post, Dave! Everything you have written about Vietnam makes me want to go!